At first look, Celerio appears broad and bold in styling. Bold clear lens headlights combined with lengthier chrome grill with Suzuki emblem is the main attraction. The front bumper is broad and has space for fog lamps.Black grill is beautifully placed with space between each grill to enable easier flow of air. The counters used on the bonnet shell gives a updated look than a plane look. Side body panel is given good lot of attention with introduction of contours running from top of rear side panel to front fender. The wheel arches are given fine finishing. The door window panels are almost as good as in the earlier version and won’t make much difference. Outer rear view mirrors are provided with side indicators in top end variant ie ZXI. The tail door panel is almost same as earlier version i.e. A star. The difference being name tag, glossy effect colours, slight variation in tail lamp design. Maruti Celerio gets a dual tone interior design with Indian favourite beige being one of the shades. Inside the vehicle gets characteristic Suzuki traits and parts that can be found on the other models of the Japanese carmaker. The large 2425mm wheelbase offers spacious cabin with extra headroom, legroom and shoulder room. Moreover, passengers get 15 smart utility spaces for putting small bags like bottles, magazines, phones and others. When compared to A-Star and Estilo, this hatchback offer more upmarket and better quality interiors. The seats have better cushioning and offers comfortable seating to passengers. The rear seats come with the option of 60:40 split flexibility to increase luggage capacity. That is what we call XpanDesign. The flowing curves of the dashboard and the way it merges with the rest of the interiors give the cabin a premium feel. All of it comes together to create a space thats perfect for you and your family to settle into and enjoy the drive. Like most Marutis, the suspension is on the softer side in the Celerio. This lets it absorb the bumps and undulations on the road fairly easily. However, drive over the bigger and badder potholes, and the thuds will be transferred to the cabin. The steering is nice and light and weighs up well as the speeds progress. You shouldn’t be cornering hard in the Celerio, but if you insist on doing it, it does fairly well. There is a hint of unavoidable body roll owing to its height, but other than that – it does feel composed. High speed stability is confidence inspiring upto 120km/h, post which the car will feel twitchy. Stopping power comes from a pair of ventilated disc brakes in the front and drum brakes at the back. Braking is standard fart – the car comes to a halt cleanly in a straight line without squiggling about too much. Celerio as a latest car from Maruti Suzuki serves well as a replacement for Astar. The introduction of Auto gear shift with which the same manual transmission is used with mechanism for automatic shifting of gears is a boosting factor for new customers. We shall soon take a long drive of the same and provide a review on it.One more important point worth mentioned is the new prices as per latest budget announced. There is a considerable drop in prices of existing models and new cars on offer give customers plenty of options. 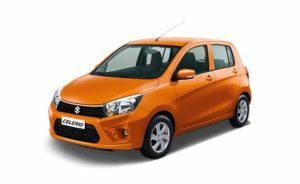 Its recommendable to test drive Celerio to experience the newness.Maruti Celerio is a welcome break from the mundane and offers a very practical automatic gear-shifting option in the budget segment. It isn’t an automatic in the true sense but offers similar levels of convenience.